I believe I have identified my one remaining mystery plant: Prunus cerasifera, or Cherry Plum. 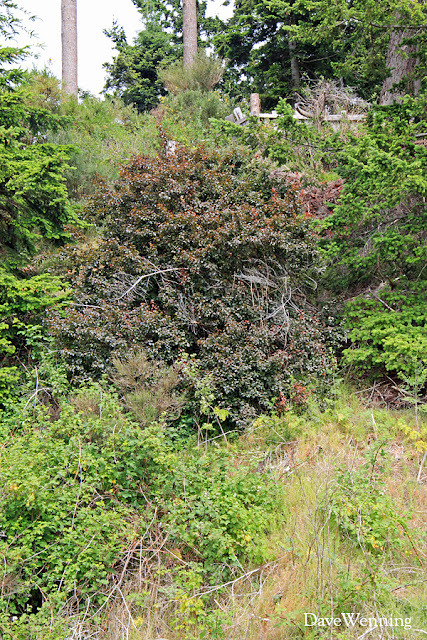 Recall that this was a small, attractive shrub that came up wild in the yard (left). I spotted a bigger one growing on the bluff further up the beach (right). It is apparently happy with a seaside location in the dry, sandy, rocky glacial soil of South Fidalgo. An arborist who will be doing some work on my big firs put me on the right track to get it identified. As usual, if the ID is not correct, or if it can be confirmed, please let me know. Click on the photos to view larger versions. New leaves open red. As they mature, they become more bronze, and later greenish. Garden varieties produce nice pinkish-to-white flowers in early spring, but mine has never bloomed. 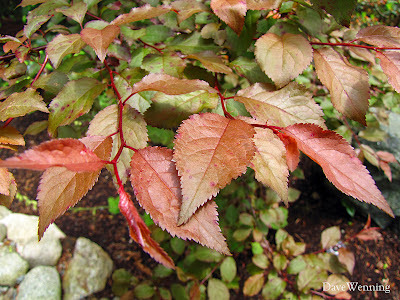 The photos I found of leaves also show them more uniformly purple. I think it is not unusual for random seedlings of cultivated plants to differ in appearance from the parent. I have now learned from experience that plants that come up on their own in the yard are not necessarily natives. This is another example of a cultivated plant that has become naturalized. Cherry Plum grows in several western and a few eastern Washington counties. According to the USDA, it is found in both western and eastern regions of North America. Unlike English Ivy and Himalayan Blackberry, the Cherry Plum doesn't appear to be an invasive nuisance here. 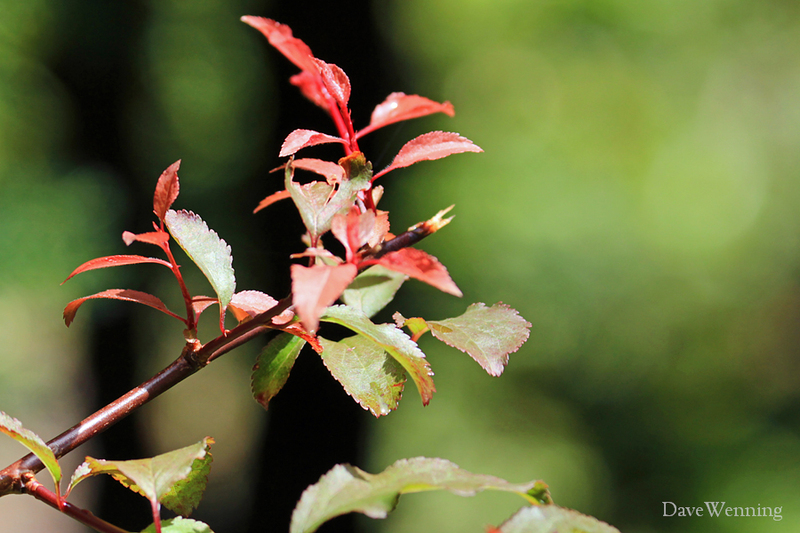 New shoots bear attractive red leaves on shiny, red stems. 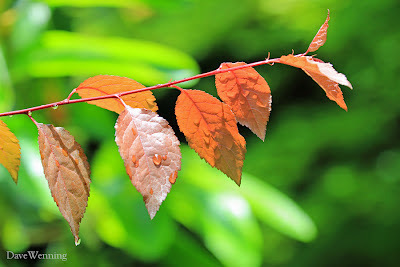 The twigs will turn a greenish brown as they age. With leaves catching the morning sun, it is an attractive shrub growing with Pacific Madronas, small Rhododendrons and Japanese Andromeda. My Columbian Black-tailed Deer like to browse on the new shoots which keeps the plant nicely pruned. I enjoy the wildlife that visits the garden. Perhaps this will keep the deer from damaging other, more valuable plants. Palmate Coltsfoot This interesting native plant grows out of the clay bluff bordering Similk Bay. 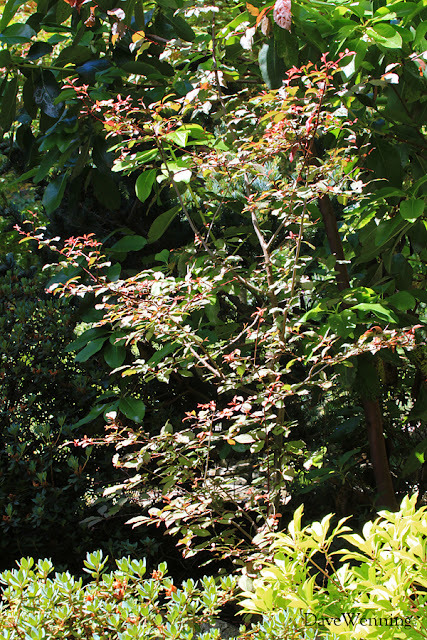 Japanese Photinia Not commonly grown in the region, but it came up wild in the yard. Purple Toadflax An attractive, drought-tolerant perennial that pops up in the yard.